Eden Hazard's solitary goal late in the contest was the difference in narrow Carabao Cup defeat at Stamford Bridge. Eden Hazard’s deflected goal late in the piece proved decisive, in a game that gave every one of the 2,800 travelling Cherries fans reason to be proud. As sang by the away fans, playing out from the back with pace in attack, particularly during the second period, the Cherries’ performance had pretty much everything but that all important goal. On a crisp and clear night in West London, Eddie Howe opted to rotate his starting XI. Artur Boruc, Jack Simpson, Diego Rico and Lys Mousset started from the off, whilst ex-Chelsea man Nathan Ake was shifted forward into a central midfield role. The hosts started the game on the front foot. Willian, Ross Barkley and Cesar Azpilicueta all fired early long-range warning shots goalwards inside the opening ten minutes. After absorbing 15 minutes of Chelsea pressure, it was the Cherries who engineered the game’s first clear-cut opportunity. Callum Wilson superbly combined with Mousset during a flowing counter-attack, with the former firing the Frenchman’s clever return pass across the face of goal and wide of the far post. Chelsea responded, with Boruc down well at the near post to keep out Giroud’s low drive from the left channel. The game was being played predominantly in the Bournemouth half, but when the Cherries ventured into Chelsea territory opportunities presented themselves. Approaching the half hour and from another swift Cherries counter attack, Brooks saw a shot from a dangerous position cannon into Mousset after some clever footwork the lively Wilson. Willian was Chelsea’s primary attacking threat. On 33 minutes he escaped the attentions of the Cherries backline only to be denied by a wonderful sprawling save from the onrushing Boruc. 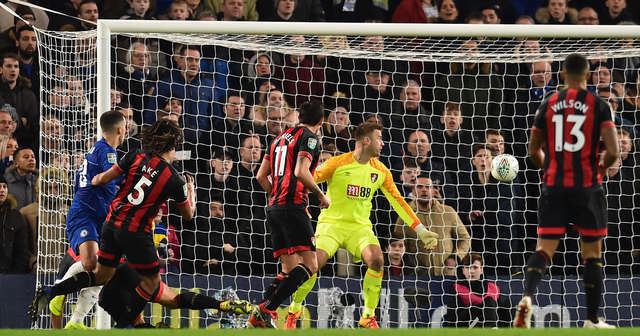 Bournemouth began to see more of the ball and visibly grew in confidence as the half wore on. Following a slaloming infield run from Jordon Ibe, Mousset was next to work Kepa, forcing the Spaniard to fly to his left to keep out a bending effort. The Cherries started the second half as they had ended the first, with impetus and confidence when in possession of the ball in tight areas. Either side of the hour mark Hazard and Ryan Fraser were introduced from the bench, as both sides committed more men forward. As the half wore on, clear-cut chances were at a premium. Fraser flashed a shot over the bar following a long throw in to the Chelsea penalty area. The final 20 minutes were a real spectacle. Resolute in defence, the men in red and black built attack after attack, committing men forward as the travelling fans began to sense a cup upset. But those hopes were shattered in the 83rd minute. Arguably against the run of play, Pedro bundled his way into the penalty before finding Hazard, who stabbed an effort into the far corner via a deflection off of Charlie Daniels. In stoppage time Steve Cook fired a low daisy-cutter goalwards and the Cherries then forced a goalmouth melee, but it just wasn’t to be despite the plucky away performance. A new-look Cherries backline defended resolutely throughout. Expertly led by stand-in skipper Cook, who looked understandably crestfallen at full time, it was only a scruffy goal from Hazard that decided the tie by the finest of margins. The manager had been forced into altering his personnel for the game, with Ake, Ibe and Daniels among those playing in unfamiliar roles. But the performance of the entire team belied any difficulties, with the away side once again so close to upsetting the odds. The late disappointment echoed that which was felt 12 months ago at the same venue against the same Chelsea team, the quarter-final exit meaning that Bournemouth have still yet to reach the semi-final of a cup competition, though they won't get too much closer to breaking that duck. While the recent form may also not yet have turned, the travelling fans will feel plenty of optimism on their way back to the south coast, with the crunch pre-Christmas clash in the Premier League to come against Brighton on Saturday.